Review by AllTheBestFights.com: 2017-08-15, great fight between Shinsuke Yamanaka and Luis Nery: it gets three stars. Both undefeated, the Wbc champion Shinsuke Yamanaka entered this fight with a professional boxing record of 27-0-2 (19 knockouts) and he is ranked as the No.1 bantamweight in the world while his opponent, Luis Nery, has a perfect record of 23-0-0 (17 knockouts) and he entered as the No.5 in the same weight class. In their last three bouts Yamanaka has won over Liborio Solis (=Yamanaka vs Solis), Anselmo Moreno (4-stars fight, Yamanaka vs Moreno 2) and Carlos Carlson (=Yamanaka vs Carlson) while ‘Pantera’ Nery has defeated Richie Mepranum (=Nery vs Mepranum), Raymond Tabugon (=Nery vs Tabugon) and Jesus Martinez (=Nery vs Martinez). 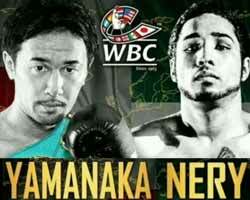 Luis Nery vs Shinsuke Yamanaka is valid for the WBC World Bantamweight title (Yamanaka’s thirteenth defense). Watch the video and rate this fight!